Everyone leads a busy life- but preserving YOUR Heritage can't wait! Heritage Makers- One of Oprahs O Magazine All Time Favorite Gifts! A friend introduced me to Heritage Makers just after my mom died in December 2006. On a snowy cold day in January 2007 as I was crying over my mothers death, I said outloud, " Mom, who will I share all of my stories with now that you're gone? The answer came in seconds when the phone rang and an old friend invited me to her home. When I arrived I saw this book on her coffee table. I was AMAZED!!! It was a story about her own family. She explained to me that I needed to tell my parents story and share it with my family. That was the day my life changed. I now tell Moms story to everyone!!! 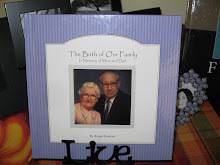 My Mom lives on in my storybooks. I celebrate my parents life, rather than hide away their photos in a dusty old shoebox. So welcome to the wonderful world of digital storybooking!! Your stories are precious and they deserve a special place where they can live forever. What YOUR story? Let Heritage Makers be a home for your lifetime memories. Preserve them in a beautiful, library bound storybook. Heritage Makers is about making dreams come true! Reach into the past, capture the present and shape the future!!! As my children grow into young adults, and family members pass on, I have found the need to preserve our family memories. The many boxes of photos and mementos were tucked away only to be visited a few times a year. My children may not remember their grandparents, family vacations, their military upbringing or special events.So I became our family's Heritage Maker. I have explored many interests & hobbies, but this one was different. It was the perfect pathway in my life and when the opportunity to be a Personal Publishing Consultant with Heritage Makers came about I knew this was the new path I needed to explore.